This film is a documentary that follows a journey made by director Abderrahmane Sissako from Mauritania, his country of birth, to Angola. He is searching for an old friend he met many years ago in the Soviet Union. Upon his arrival in Angola, he asks a wide variety of individuals if they recognize his friend in a photograph he carries around with him. This quest to find an old classmate hides a deeper story--that of the people Sissako meets along the way, who give him much more than simple yes or no answers. Instead, their conversations reveal very personal snapshots of their lives and of Angola itself, which has been devastated by civil war. 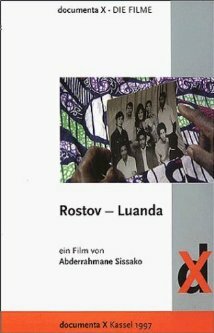 Frontani, Michael R. “Review: Rostov-Luanda by Abderrahmane Sissako.” African Studies Review 46.3 (2003): 199-201.